Let other geeks have their T-shirts with fictional space explorers -- now you can emblazon your chest with 23 space missions that have really explored space! Designed by Thomas Romer at Chop Shop, this incredibly awesome shirt features silhouettes of 23 of the great space missions from across Earth that have pushed the boundaries of solar system exploration. And Romer is generously donating $5 for every T-shirt sold to The Planetary Society. Here's the design in detail. I won't spoil the fun for you readers by naming all the spacecraft that appear on the shirt (though I will point you to a key if you get stumped). However, I will mention a few of the active and recent missions that are on it: Cassini-Huygens, Hayabusa and its sample return capsule, Spirit or Opportunity, Dawn, MESSENGER, Deep Impact, and Rosetta and Philae. See if you can find them, and then see if you can name all the others! 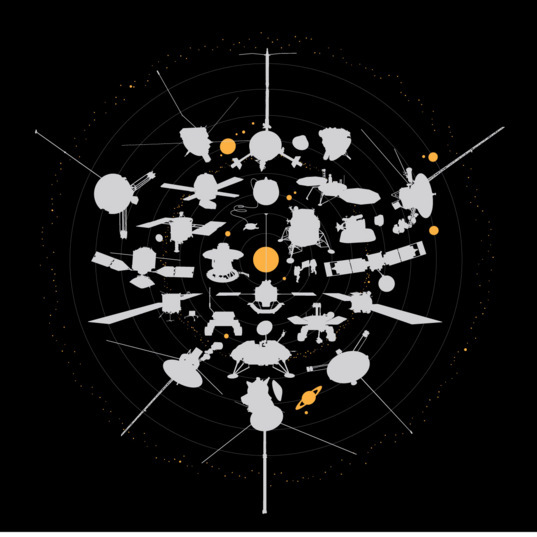 This T-shirt design from Chop Shop includes 23 robotic and human missions of exploration that extended beyond Earth to targets including the Sun, planets and their moons, comets and asteroids. Nearly every icon represents a specific robotic explorer (or series) with the exception of the Apollo program which continues to be the single human endeavor to ever go beyond the cradle. I hope to spot a number of these shirts at the Division of Planetary Sciences meeting in a couple of weeks! OK, I've found the page describing the T-Shirt but I haven't a clue how to purchase one. (Or any other Planitary Society themed T-Shirts). HELP!